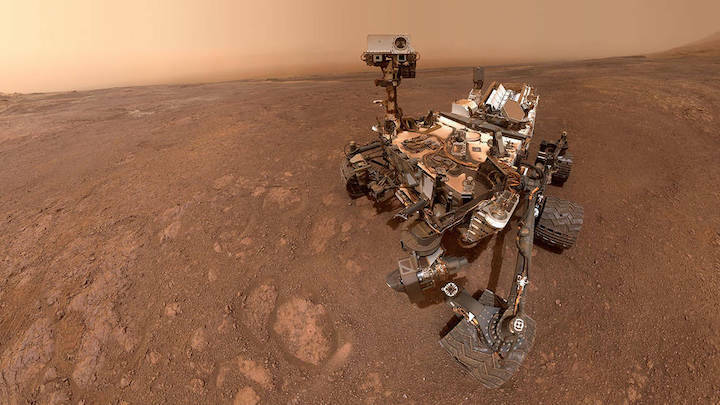 A selfie taken by NASA's Curiosity Mars rover on Sol 2291 (January 15) at the "Rock Hall" drill site, located on Vera Rubin Ridge. NASA's Curiosity rover has taken its last selfie on Vera Rubin Ridge and descended toward a clay region of Mount Sharp. The twisting ridge on Mars has been the rover's home for more than a year, providing scientists with new samples — and new questions — to puzzle over. Curiosity has been exploring the ridge since September of 2017. It's now headed into the "clay-bearing unit," which sits in a trough just south of the ridge. Clay minerals in this unit may hold more clues about the ancient lakes that helped form the lower levels on Mount Sharp.